As your pastor I feel this great tension. I know God has so much in store for us as His church. He has a dream for us of reaching this community in a way that doesn’t make sense to anyone. He is assembling his troops to do something here. For crying out loud, He brought me to be your Pastor. I don’t say this to boast, except to boast in my weaknesses as a leader. There is no reason whatsoever that I should be here leading you. No reason except this, that God wanted to reach this community for Him and He wants people who will let Him do that through them and not get in the way with their own ideas and their own ways of doing things. It’ Tuesday evening, do you remember what God spoke to you on Sunday? The reason this concerns me is that I want us to experience all that God has in store for us as His body assembled at Whipple Creek (becoming SixEight Church). But, we will never experience all God has to offer if we come to church to get our Jesus fix and then put on the clothes of this world when we get in our cars and go home. We will never experience the full goodness of God if we don’t let him have total control over all of our lives. Day in and day out. There are a billion things to distract you as you get back to life after Sunday. Some of them good, many of them ok, some of them bad. But does God ever make it in to any of those things. Does God ever move up the to do list? Does God ever take higher priority? Does God ever become a get to instead of a have to? Do you just work God in if you get a chance between your family, your job, your food, your hobbies, your friends, your TV, your games, your movies, etc.? We won’t experience all God has to offer His body, if we don’t experience God outside of Sunday mornings. And if we’re not experiencing God outside of Sunday mornings, how are we going to be the light of love to the people around us who are (Whether they know it or not and whether you like it or not) relying on you and me to be the aroma of Christ to them? I’m not just trying to get you to remember my sermon. I don’t care about that. What I care about is what God says to you while I’m speaking. And, what I fear is that you heard from the God of the Universe on Sunday, but have already forgotten and it’s only Tuesday. If you don’t remember, maybe remembering what we talked about will help. Our main point was “When we love as God loves, we will do as God does.” We talked about how the number one thing we can do to reach the lost is to love them as we remain in God’s love (the vine and the branches – John 15). So, what about this love then? Ask God to help you love them. Take it another step, ask God to help them see His love through you. Yes, pray for that person. Pray that God will use you to show them His love. No one comes to Jesus unless the Father draws them. “A strong, cold wind cannot blow the coat off a man’s back, but when the warm sun shines steadily and gently down on him, he will freely choose to remove it.” – Ginny Jaques. We need to pray that God will use our love to draw people in to Jesus. This is a very good and appropriate thing to pray for. Since it is God who draws people to Jesus, they have to see and experience God’s love for themselves. What better way for them to be drawn to God except to experience His love from you and me? It’s Tuesday evening, how have you done the first two days of this week loving those God has put in your 8 to 15? Perhaps you forgot that you were supposed to be doing that until just now. That’s why I’m writing this post, to help you remember – while you still have the majority of the week left. It’s Tuesday evening, will you allow the love of the vine (Jesus) to flow through you (the branches) to produce the fruit of God’s love in others? 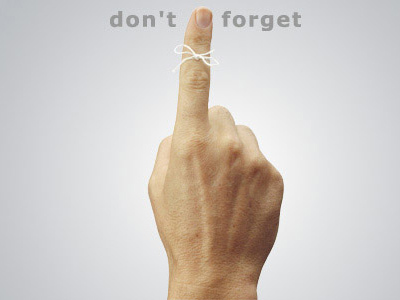 Or have you already forgotten?